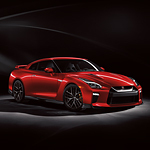 One of the most popular sports cars on the road today is the Nissan GT-R. Its top-level performance features and sleek design keep car buyers coming back year after year to see all of the improvements that Nissan engineers have made. That is why we here at Lithia Nissan of Medford are so excited to tell you all about the arrival of the all-new 2019 model! This sports car comes standard with all-wheel drive allowing the drive to feel all of the improved control on the road whether you're cruising through city streets or making a detour on a few back roads. Additionally, car enthusiasts will love the power that comes with its up to 600 horsepower engine. This engine also puts out an extremely impressive 481 lb-ft. of torque. This means that your car will literally leap at the road before it when you even touch the gas.